Free Shipping Included! 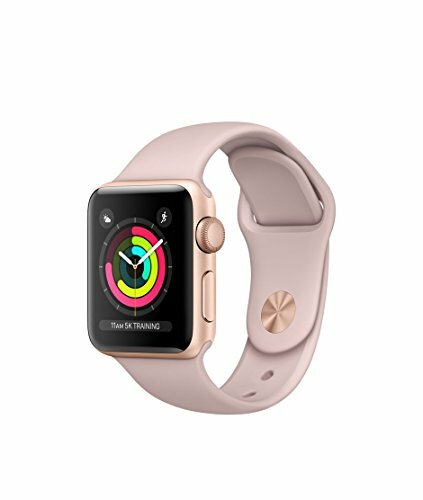 Apple Watch Series 3 - GPS - Gold Aluminum Case with Pink Sand Sport Band - 38mm by Apple at Tobby News. MPN: MQKW2LL/A. Hurry! Limited time offer. Offer valid only while supplies last. Stay connected in style with the 38mm GPS-only Apple Watch Series 3, which comes with a gold anodized aluminum chassis and a Pink Sand Sport band. Stay connected in style with the 38mm GPS-only Apple Watch Series 3, which comes with a gold anodized aluminum chassis and a Pink Sand Sport band. Designed for users looking for the next generation of connectivity, Apple's Watch moves your iPhone's apps and functions to your wrist, so you can do more while leaving your phone in your pocket. Apple Watch connects to your iPhone via Bluetooth 4.2 and displays notifications, apps, and more on its 1.3" display. It can also connect directly to the Internet thanks to 802.11b/g/n Wi-Fi. The internal battery lasts for up to 18 hours of normal use and is recharged with an included inductive magnetic charger. Apps Enjoy the iOS apps you love on your iPhone, tailored for Apple Watch. Notifications Leave your phone in your pocket and view notifications on your wrist. Apple Watch displays alerts from your iPhone so you can respond or dismiss them at will. Its Taptic engine gives you a gentle tap on your wrist or an audio cue when notifications come in. GPS Built-in GPS lets you navigate and get accurate workout data - no phone required. It connects quickly to GPS satellites and records distance, speed, and pace for your workout as well as the route you traveled and whether you're walking, running, or cycling. Water-Resistant The Apple Watch Series 3 is designed to withstand the pressure equivalent of being 164' underwater (5 ATM), meaning that it's suitable for rain, spills, showers, pools, and oceans at shallow depths. Its internal speaker uses its own vibrations to force water out once it's clear of the waves. Glances Glances are scannable summaries of the information you need most. Simply swipe up from your watch face and you'll instantly be able to do things like see what's next on your calendar or find your location on a map. Complications Complications are small widgets that appear on the face of your Watch and provide quick access to frequently used data.